I grew up watching RKO and MGM musicals, and have always loved that kind of film with snappy dialogue, lush soundtracks, stylised visuals and excellent casting. I am a bit resistant to the remake in general – I tend to think that if a film was great first time around, why mess with it. So I was surprised by how much I like Chori Chori. 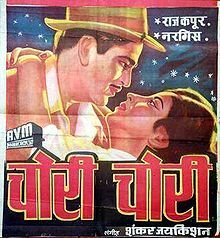 It is ‘inspired’ by the 1934 Frank Capra film ‘It Happened One Night’ starring Clark Gable and Claudette Colbert, and has the legendary jodi of Nargis and Raj Kapoor at the fore, directed by Anant Thakur. Chori Chori seems to me to be the perfect balance between slick Hollywood and heart on sleeve Bollywood. One of my great friends often says ‘Raj Kapoor was sleazy…and not in a good way’ which never fails to crack me up and is the thing that pops into my head when I see him. I didn’t ‘get’ Raj Kapoor til I saw this film and drew the connection to the Gable style of Hollywood hero that used equal measures of smarm and strong-arm to win the day. I’m still not a huge fan, but I can at least glimpse what it was that makes him such a significant figure in the Hindi film industry. Nargis is Kammo – spoilt daughter of the super wealthy Ghirdarilal (Gope). She is determined to marry the dashing pilot Suman (Pran!) but her father is sure Suman is only after the dollars not his daughter. She jumps ship and swims to shore, determined to make her way to Bangalore and Suman’s arms. I have to say she showed some moxy in pawning a diamond ring to fund her travels, but the white net sari she bought with the proceeds struck me as wildly impractical for a long bus trip. 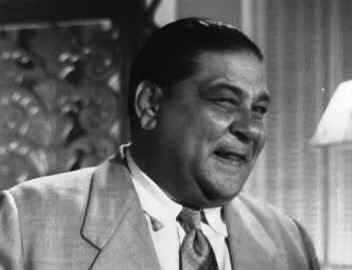 Also bound for Bangalore is struggling journalist Sagar (Raj Kapoor). The two loathe each other on sight and of course we know that can only mean true love is round the corner. Sagar is reluctantly drawn into helping Kammo, caught by his chivalrous nature, curiosity and later by his attraction to her. He wears a western suit and hat, slightly the worse for age, and his look could have been lifted straight from Hollywood Central Casting. He represents the heroic battler, trying to make a decent living while keeping his morals intact. He cuts a deal with Kammo – he will help her get to Bangalore and Suman, and he will reap a financial reward when he sells his story. Ghirdarilal places adverts offering a reward for anyone who returns Kammo to him. Thus there is ample opportunity for a host of minor characters (including Johnny Walker) to join the treasure hunt, and a catalyst for throwing the sparky leads together. As they travel incognito, scenes cut away to Suman who is shown to be a gold-digger with an eye for dancers. This is not bad for the viewer as we get to enjoy a very nice classically inspired dance, but we already know which man Kammo should marry. Kammo and Sagar miss their bus, and continue to travel together under the pretence of being married. 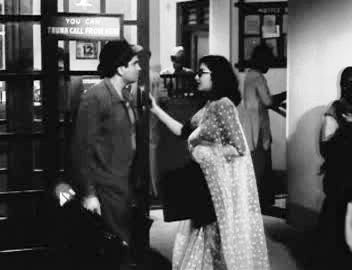 Raj is only carrying a small valise and yet I lost count of how many pairs of stripy pyjamas he seemed to have packed. Mind you, Nargis seems to amass a decent collection of saris along the way so it’s probably only fair that Sagar has an extensive range of sleepwear. The pyjamas were quite significant in ‘It Happened One Night’, but rather than share a single pair of pjs this couple get matching his n hers. Lots of them. Perhaps the wardrobe team had the day off when someone came up with Kammo’s alluring night attire. They encounter suspicion and adversity and their own growing feelings. Sagar wanted the story and maybe the money, and Kammo wanted Suman – neither of them wants to acknowledge what is changing between them. They offer each other small kindnesses – the loan of the ubiquitous pyjamas, a blanket thrown towards a sleeping Raj – and lots of snark. The dialogue by Agha Jani Kashmiri is sharp and delivered with perfect timing. These two really are a match for each other and the chemistry is sizzling. It’s all quite predictable down to the last twist and turn but it is still compelling. Nargis is stunning in her portrayal of the feisty Kammo. She isn’t afraid to articulate her feelings for Sagar, whether in song or dialogue, and challenges his reticence. 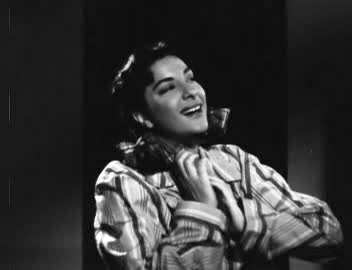 In one scene, heartbroken Kammo walks through a storm and Nargis exudes grief so profound it outshines all the environmental theatrics. It is a bit irritating, although perfectly in tune with the era, after such an independent start Kammo appears to realise she should never have defied her father or left her home, although that may be her own idea of a necessary penance. Kammo’s relationship with her father was perplexing. Kammo was spoilt rotten and certainly lacked for nothing in the material sense. He locked her up to stop her marrying Suman and really did not believe that anyone would marry ‘baby’ for anything other than his money. He was devastated when she disappeared but trusted Kammo to tell him as much as she wanted to on her tearful return. So I kind of blame Ghirdarilal for making Kammo susceptible to Suman’s flattery as she was seeking approval she didn’t get at home. But he also made her the kind of brat that needed a reality check. Oh these filmi parents! Raj Kapoor seems content to mostly allow his leading lady to dominate, and is fairly low key. Until the puppet song which I think was designed to allow him to release all the repressed over-acting. He spouts a lot of philosophy about the joys of the simple life, which seems to impress Nargis. I’d have more faith in that if Sagar had ever lived anything other than a simple life and so could make a valid comparison, but I’m a cynical viewer not a filmi heroine. A disquieting note throughout is the equation drawn between marital status and the individuals’ threshold level for physical violence. One scene has a landlord test whether Sagar and Kammo are married by smacking Sagar around. The fact that he doesn’t flinch is accepted as proof he must be married to her! Slaps fly in this film, and while they are generally shown as a symptom of passion, it’s still a bit disconcerting and causes me to remind myself this is the 50s. 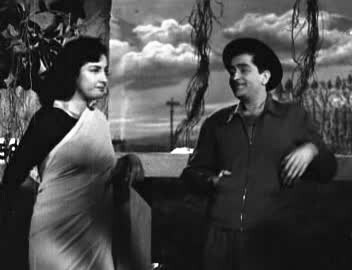 For those wondering, Nargis lands some excellent shots, which I enjoyed, but on the downside the women in Chori Chori are generally portrayed as the aggressors in domestic violence. The music is used to perfection in this film. Each song acts to illuminate the innermost thoughts of the characters singing or those observing the performance. Shankar-Jaikishan have the perfect big band sound for the romantic duets, and the orchestration is lush as befits this story. The songs show a range of musical influences and are very well integrated into the narrative. And who doesn’t swoon just a bit on seeing Asha Bhosle, Lata Mangeshkar, Manna Dey and Mohammad Rafi all on a soundtrack? 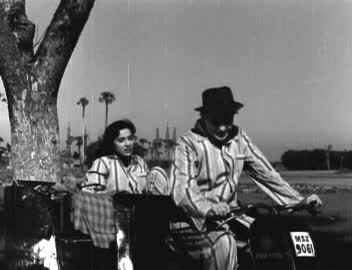 The classic visual devices from ‘It Happened One Night’ appear throughout Chori Chori – particularly the wall Sagar creates in their shared rooms by draping a blanket over a rope, those stripy pyjamas, and the cramped bus trip. It’s a fairly faithful remake, adapted to suit its audience’s sensibilities, and the changes don’t weaken the story. This entry was posted in Bollywood and tagged Agha Jani Kashmiri, Anant Thakur, Bollywood, Chori Chori, Classics, Gope, Hindi, It Happened One Night, Johnny Walker, Nargis, Pran, Raj Kapoor, Shankar-Jaikishan. Bookmark the permalink. You’re welcome 😀 We should both blame my friend Ruchi (who never explained what sleazy in a good way might be). But seriously, he did make some wonderful films. It just took me until Chori Chori before I got what he was on about. I am particularly fond of Awara as well as this film. I do tend to think that if you have to have an affair with your leading lady in order to generate the requisite chemistry, that may be a sign of a bad actor but I won’t pursue that thought! Hi Rohit. Thanks for the film suggestions. 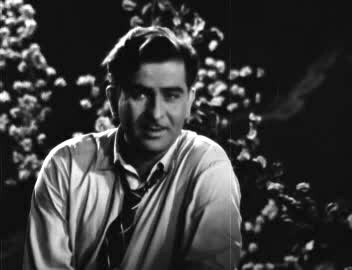 I admire Raj Kapoor’s vision and talent, but tend to find I enjoy his work if I watch it in small doses, with a break between. I suppose I’m about due for another of his movies, and I will keep an eye out for one of these. Cheers, Temple. And plz dont mind, u said u admire RK but If u havent seen even 1 of these then u have hardly seen anything of Raj Kapoor to admire. I understand the image u have made in ur mind of his from only watching movies lyk mera naam joker, sangam, awara, shree 420 and one or two more. Right? Thts all of RK u have seen…? See Raj Kapoor beyond these movies and you will know what he was all about. Till 2 yrs back, even i thought tht RK was all ‘Chaplinsque’… but in these 2 yrs I have seen enough of his work(as an actor primarily), which totally changed my perspective of him. Yup.. have a nice time watching. Phir Subha Hogi is my fav. movie of the lot, though it has to a small extent that “common man persona”.. but only for the first half. I am a little surprised though that chori chori hasnt done much to change ur opinion regarding the tramp stuff about RK. 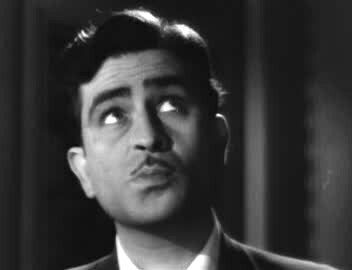 Anways, thanks for being patient while reading me raving about Raj Kapoor. I am not really a crazy fan or something of Raj Kapoor, as my comments might apparently suggest. Its just that it irks me a little when i hear ppl saying tht he only copied charlie chaplin, and had no talent of his own, Trust me, there r many who feel so. I’ve been meaning to watch this one, so this was a good incentive to finally order it. 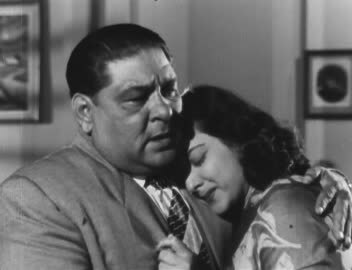 I just watched “Aah” with Nargis and Raj Kapoor, and they do have great chemistry. 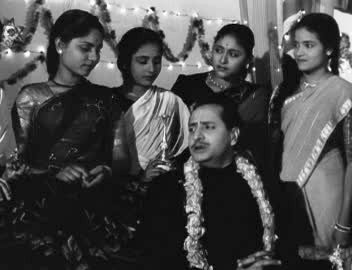 That one also had Pran (so young!) as the guy Nargis doesn’t marry. On a side note, I just don’t get what they were trying convey by putting Nargis in pigtails in all of these movies. Was it to make her look young? Those pigtails have me mystified too 😦 It was such an unflattering look. I have ‘Aah’ on the to-be-watched pile but never seem to get to it. It will shuffle up a few places now 🙂 I just read your review of Saroja so that’s on the list too!